Hang Liu, assistant professor in Apparel, Merchandising, Design and Textiles, right, demonstrates use of a wet spinning machine in her lab, turning cotton waste into new fibers. 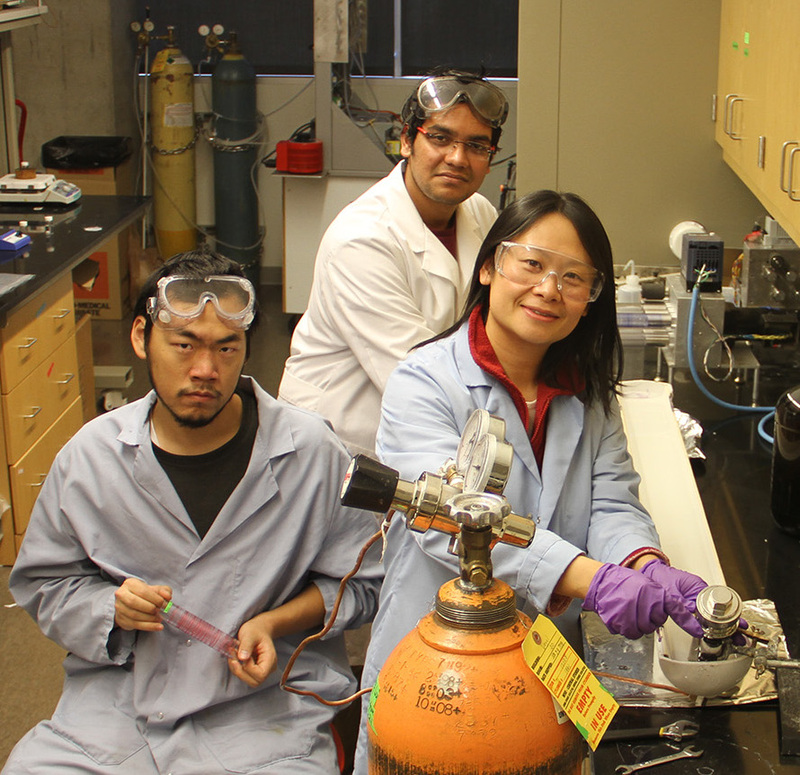 She is assisted by student researchers Wangcheng Liu, left, and Badrul Haque (Seth Truscott-WSU Photo). Thanks to new technology and support from the M.J. Murdock Charitable Trust, scientists at Washington State University are helping keep millions of tons of cotton and cellulose waste out of the landfill, spinning it into valuable fibers for new clothing. Fiber consumption is on the rise as a growing world population demands textiles for clothing, homes and industries. At the same time, the recycling rate of textile waste is extremely low: less than 1 percent of clothing gets recycled into fibers for new clothing, representing a loss of more than $100 billion worth of materials each year. “More than 13 million tons of textiles go to waste every year in the United States,” said Hang Liu, assistant professor in the Department of Apparel, Merchandising, Design and Textiles. “In Washington’s King County alone, 40,000 tons of textile waste that ended up in landfills in 2015. “The textile industry is eager to put that waste back into use,” she added. Manufacturers are actively seeking sustainable practices that keep materials in use as long as possible, and find new value for them once they’ve been used. Partnering with Ting Chi, associate professor in AMDT, and Jinwen Zhang, professor in the School of Mechanical and Materials Engineering, Liu this fall enhanced her research project through a new grant, “Environmentally Friendly Cotton/Cellulose Waste Recycling,” with $120,000 in funding, $60,000 from the M.J. Murdock Charitable Trust and $60,000 from the Washington State University Office of Commercialization. 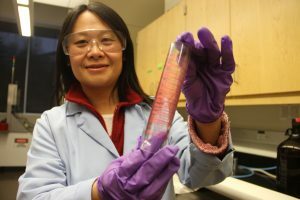 Dr. Liu shows off the finished recycled fibers—a completely new product made from waste. Her team is exploring wet spinning’s potential to transform material than now goes to the landfill (Seth Truscott-WSU Photo). The grants allow the team to set up a large, laboratory-scale device, called a wet spinning machine, that produces new fibers from cotton waste textiles. She’ll use it to make fabric samples with commercial potential, helping the fabric industry learn how to use and develop regenerated fiber products. “This technology helps close the loop, turning waste into high-quality products in an environmentally friendly way,” Liu said. Learn more about Liu’s research and the Department of Apparel, Merchandising, Design and Textiles here.